How does the current know how much to flow, before having seen the resistor? How will the current I know how much to flow? Would any other wave travel first in the circuit and then come back and say so much current should flow? Not sure if this is what you're asking, but yes, when the battery is connected, an electric field wave travels from the battery down the wires to the load. Part of the electrical energy is absorbed by the load (depending on Ohm's law), and the rest is reflected off the load and travels back to the battery, some is absorbed by the battery (Ohm's law again) and some reflects off the battery, etc. Eventually the combination of all the bounces reaches the stable steady-state value that you would expect. We usually don't think of it this way, because in most circuits it happens too quickly to measure. For long transmission lines it is measurable and important, however. No, the current does not "know" what the load is until the wave reaches it. Until that time, it only knows the characteristic impedance or "surge impedance" of the wires themselves. It doesn't yet know if the other end is a short circuit or an open circuit or some impedance in between. Only when the reflected wave returns can it "know" what's at the other end. See Circuit Reflection Example and Transmission line effects in high-speed logic systems for examples of lattice diagrams and a graph of how the voltage changes in steps over time. And in case you don't understand it, in your first circuit, the current is equal at every point in the circuit. A circuit is like a loop of pipework, all filled with water. If you cause the water to flow with a pump at one point, the water at every other point in the loop has to flow at the same rate. The electric field waves I'm talking about are analogous to pressure/sound waves traveling through the water in the pipe. When you move water at one point in the pipe, the water on the other end of the pipes doesn't change instantly; the disturbance has to propagate through the water at the speed of sound until it reaches the other end. With the second circuit (two resistors in parallel) it is reasonably clear that the same amount of current that flows into the top junction must flow out from the bottom junction (see Kirchoff) If the resistors are the same, then they will share the current equally. this can be though of as one large pipe (wire) splitting into two narrower pipes (resistors) and then fusing back into one large pipe again. If they are unequal, then one will take more flow (current) than the other but the total out will always add up to the total in. You could ask the same question with the water analogy - how does the water "know" how much to flow? Because it's limited by the pipes width and the pumps pressure. EDIT - It seems the question being asked is a little different than I supposed initially. The trouble is there are a few different answers (as you can see) at different levels of abstraction, e.g. from Ohms law to Maxwell to Quantum physics. At the individual electron level I think you might have a problem due to particle wave duality and double path (see double slit experiment with photon) mentioned by Majenko. Note that the reason I said above that "the water is always there" is because the electrons themselves do not flow at ~2/3 the speed of light round a circuit, rather the energy from one is propagated to the next (sort of) and so on. A bit like balls bouncing around randomly and into one another, with a average tendency overall to bounce in the direction of applied potential. A simpler way to think of it is like a line of snooker balls - if you hit the white ball into one end, the energy will be "transmitted" through all the balls (they will not actually change position though), and then ball at the other end will break away. Either way I think this an excellent question and needs a good answer (will try and improve this one if time allows), although at the lowest level may be better dealt with on the physics stack. At first, the current doesn't really know. Assuming a big cartoony switch in the line, when open, it represents a huge impedance. (Capacitive) charge builds up on either side of it; specifically, electrons crowd the negative terminal and the positive terminal lacks the same number of electrons from normal (image charge). Current flow is negligible (fA*), so there is no potential drop across the resistor. Electrons have no net movement or flow because the electrostatic repulsion with their neighbors, including the big bunch at the switch, is equal to the force from the external electric field bias. When the switch is first closed, the extra electrons near the switch zip to the other contact, filling in the image charge. Now that there isn't a big bunch of bully electrons refusing to move and pushing back, the rest go ballistic (hah! not actually, though) and start to zip through the circuit. Those in and near the resistor meet ... resistance (c'mon; I had to). There aren't nearly as many free electrons or sites, so, not unlike the very large impedance presented earlier by the switch, charge builds up on either end as the impatient buggers jostle for a spot in line. It continues to build up until equilibrium is reached: the electrostatic field from the bunch of electrons waiting to get through the resistor is equal to the external electric field bias. At this point the current knows how much to flow, and won't change ['til you realize that you put in a 1.3-ohm resistor instead of the 1.3-kohm, and it fries and open circuits again]. If the source were totally removed from the system at first, there would be no initial capacitive charge. 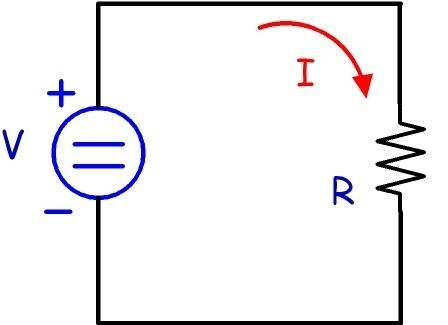 An instantaneous connection with the source (DPST switch) would lead to an electric field propagating along the wire near c, accelerating and dragging electrons along with it, and leading to the same leaving-the-football-stadium-type crowding at the resistors. In the case with parallel resistors, however, the doors of said stadium may be of different widths, so the equilibrium currents will differ. How does the current in a river delta "know" which branch to take? "Current" in each case means the aggregate flow of water molecules or electrons, so first, replace the question with "How does each electron (or molecule) know which way to go"? It doesn't; it will just get swept along in the immediately local flow, and at the micro- or atomic level, will take the place of the departing one just ahead of it. So, what happens right at the point of the diverge? To our macro eyes, the direction it takes is random, distributed as the ratio(s) of the branch currents. At the very lowest level, some tiny disturbance will nudge it one way or the other. "Knowing" how much to flow implies knowledge, which implies intelligence. Current is not intelligent, and doesn't flow per se. Current is pulled, or "drawn" by the load - in this case the resistors. In the first circuit that is simple enough to calculate. The amount of current then flowing through each resistance is then determined by the ratio of the two resistors. If the resistors are the same, then exactly half the current will flow through each. If \$R_1\$ is twice \$R_2\$, then a third of the current will flow through \$R_1\$, and two-thirds through \$R_2\$ (note the current ratio is the opposite of the resistance ratio). Actually, the current doesn't know how much to flow at t=0. Every resistor have some capacitance, since they consist of the conducting sides separated with an insulator (even though not perfect). Because of this capacitance, at t=0, current rushes as much as the power supply can supply. Then it slows down after a while to its normal value. Every practical resistor can be modeled as a resistor and a capacitor in parallel. So, your first circuit is actually a parallel R-C circuit. Also, don't forget that E field (electric field) creates B field (magnetic field), and vice versa. When you apply a voltage across the resistor, what you do is you create an electric field inside the resistor. Which causes a change in the state of the electric field (you rise electric field from zero to a non-zero value). The change in the electric field creates magnetic field and it finally creates a flow of current. Please refer to Maxwell's Equations for more information. How current knows ? It knows because of statistical mechanics (with Boltzman and later Fermi-Dirac involved, and later Maxwell), when fermions (electrons) at particular temperature tend to occupy the volume of conductor (metal) when electrons fly free like particles of ideal gas and bounce against atoms. Speed (energy) of individual particles is about 1K miles per second (less than speed of light), drift speed is few millimeters per second (see wiki "drift speed"). Average free fly distance of electrons defines "conductivity". To observer of electron flow, the behaviour of electrons will look like a tendency of particles to maintain "electroneutrality", when every local part of conductor contains approximately equal amount of electrons and protons. Electrons are charged, so they apply repelling force to each other. The involvement of force, velocity and mass over time means that there are virtual photons emitted and absorbed during acceleration and deceleration of electrons. This photons are propagating much faster than particles and create "pressure". Overall depending on material, the speed of pressure wall is close to speed of light. It can be named "wave". The rest of the story is better explained by Endolith above. The numbers for copper at room temperature can be seen in this article. Nobody mentioned the fact that all schematics adopt the so-called lumped element model. In a schematic a wire is not a wire in the common sense, it is a simplifying relationship between nodes. If you wanted to describe step by step what happens to the current (or what it "senses") along a wire, you would have to draw an infinite series of passive elements. Best analogy that helped me to understand it really quick and easy, I've met somewhere on Internet, but can't point the source at the moment. If someone know where it is, let me know, so this can be included. Analogy is very short and this will be very short answer. No formulas whatsoever. So it is kind of non-scientific, but is elegant analogy and really easy for human being to imagine and comprehend. Most people imagine a simple circuits like those in examples like a empty tube or pipe that is filled with water. This is partly because the prolific water flow analogy. In reality it is much more like a tube filled with solid balls like bowling tube. That tube is filled with balls in line from end to end and there are no gaps between them. When you push the ball in one end, all balls travels the same distance. This movement is the current of electrons and force needed to move the balls is the applied voltage. Other source of confusion is the "least resistance path" sentence. Someone can imagine a person on the crossroad that choose the 1 of 3 possible ways. When person took a way all of the person go that way, and this is exactly how current DO NOT FLOW. Instead current will "split" and flow in all possible directions, but proportionally to the resistance in those ways. Sometimes resistance in so high, that current amount is so small, that is beneficial to be neglected for simplifying. You can get \$I_S\$ another way, by considering the equivalent resistance of \$R_1\$ and \$R_2\$ in parallel. Actually, waves have a lot to do with it, until a steady state is achieved. Initially, even the most simple circuit made of a battery, a switch, a wire, and a resistor, is a transmission line, surrounded with electromagnetic waves, and requires a transient analysis to understand. This transient analysis will answer the initial question in this blog, if I understand the question... Even the battery is complex, and initially, until steady state is achieved, requires an analysis that is governed by maxwells eqn's, and more. In years past, DC101 was initially taught using the analogy of water in pipes, etc. Analogies were drawn for inductance and capacitance too. It is a great way to help someone understand DC, if you have five minutes to teach it to them, and ohms law is as far as you will take your student. It is like a motorway full of cars where the motorway is the conductor and the cars are the electrons. If there are roadworks ahead limiting the motorway from three to one lane, all lanes slow down and the cars 20 mile behind will also not able to go faster on the three lanes section because the cars in front will not let them. Not the answer you're looking for? Browse other questions tagged current kirchhoffs-laws or ask your own question. How does an outlet know what wattage to put out? How multimeters measure current in this circuit? How does a circuit “know” the resistance? Transistor - Why does amplification happen before the transistor and not after? Does electricity go from negative to positive or vice versa? Why doesn't it matter if a resistor is before or behind an LED wrt voltage drop? Constant current in a circuit? How does the current limiting resistor for an LED affect current and voltage drops? How does current flow through a voltage source? Does max current (amps) always flow through circuits? Will current flow through both loops of the 2nd circuit? If Conventional Current is wrong, how can I trace the flow of current in a schematic? In what kind of circuit does current flow?